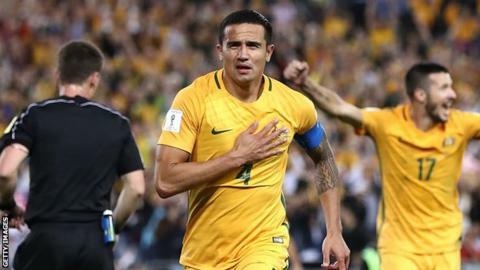 Australia international Tim Cahill says playing for Millwall will give him the best chance of featuring at the World Cup in Russia this summer. The 38-year-old has rejoined the Lions as he bids to represent the Socceroos in a fourth successive tournament. "I had to make a decision for football reasons to test myself at the highest level possible at my age before a World Cup," he told BBC Radio London. "The Championship is the biggest test outside of the Premier League." Cahill left Australian A-League side Melbourne City in December, having helped Australia seal their place at Russia 2018 with two goals in their play-off against Syria and then started the home leg of their second play-off against Honduras. The Sydney-born forward is his country's record scorer with 50 goals in 104 appearances, and could join a select band of players to have scored at four World Cups if he is named in Bert van Marwijk's squad for Russia 2018. Only Brazilian great Pele and Germany striker Uwe Seeler, who both achieved the feat from 1958 to 1970, and Germany's Miroslav Klose, the tournament's all-time leading scorer, between 2002 and 2014, have done so. However, having spent seven years with Millwall between 1997 and 2004, Cahill says he is solely focused for the moment on being "back in the trenches" with the Lions. "I am not thinking about the next World Cup - I am thinking about Millwall," he said. "It is about giving giving something back. "At this stage of my career, I am here to do whatever I can to contribute and I am doing it for the right reasons. I am looking at doing something special again." Cahill will have to build up his fitness levels before making his second debut for the south east London club, but he was presented to supporters at The Den before their 0-0 draw with Derby on Tuesday. "The other night, I can't thank the fans enough," he said. "At the start I was quite chilled but it was very emotional. "Just coming home, that one moment, will be with me forever. It has been 14 years away but I will never forget people who made me… coaches, clubs, fans, staff. "If I can score at The Den I don't know what would happen and what I'd do."